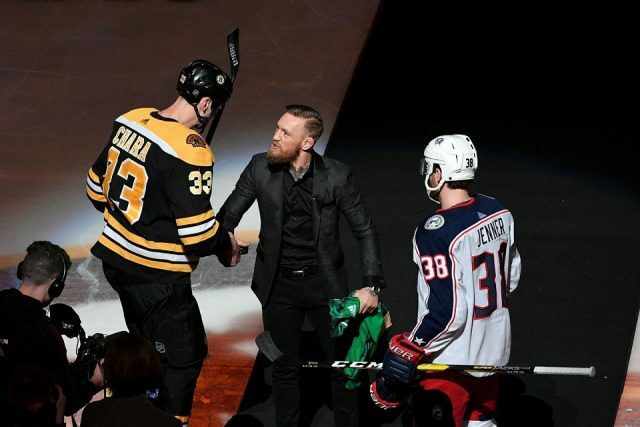 On Saturday, March 16, world-renowned boxing and MMA champion Conor McGregor attended the Boston Bruins game at TD Garden like a celebrated hero returning home and even threw down the ceremonial puck during the pregame ceremony. The NHL club, celebrating Irish Heritage Night on the eve of St. Patrick’s Day, invited McGregor into the Bruins’ locker room before the game to speak to the team. Cameras followed the 5-foot-9, 154-pound man as he yelled encouragement at the players, including an “I say ‘Boston,’ you say ‘strong!’” chant that hyped those wearing the Black and Gold—both the players and the fans—up before facing off against the Columbus Blue Jackets. Following the conclusion of the ceremonial puck drop, the Irishman even told Bruins’ captain Zdeno Chara to “put him through the net,” referencing Blue Jackets’ captain Boone Jenner. McGregor was in town for Boston’s St. Patrick’s Day Parade, which makes its way through the neighborhood of South Boston every year. Though it was an unannounced surprise, an appearance at a Bruins game makes sense, given that boxing has its own place in hockey’s fighting rules, and provides perfect promotions for the Bruins’ organization to boast. However, McGregor brings a fairly violent and tainted history that the Bruins are now rubbing elbows with. Five days before his appearance in Boston, McGregor was arrested in Miami, FL, charged with two felonies for strong-arm robbery and criminal mischief. This isn’t his first arrest in the United States; McGregor was also arrested last year in New York, having been initially charged with three counts of assault and one for criminal mischief for an altercation in which he sent two UFC fighters to the hospital after throwing a dolly through a bus window. McGregor has been involved in two other incidents of assault that revolved around other fighters in his career. This, though, is perhaps the first time he has been involved in a violent incident with a previously unknown civilian. McGregor was exiting a hotel with a 22-year-old man, both waiting for their rides, when the 22-year-old, Ahmed Abdirzak, says he recognized McGregor and began to take pictures of his with his phone. Allegedly, McGregor approached Abdirzak and grabbed his arm, dispossessed the phone, and “slapped” it to the ground, then stomping on it several times. McGregor then is accused of picking up the phone, placing it his pocket, and having it on him when he was arrested five miles down the road in the wee hours of that morning. In the state of Florida, both of these acts are felonies. McGregor nor his representatives have said much on the arrest following his bail on Mon. but did say that McGregor would be willing to cooperate with the legal proceedings in regards to the matter. McGregor was sighted in Chicago later in the week, and then on the ice of the TD Garden Saturday night, fist-bumping Bruins players. I did not watch the Irish Heritage Night, much to my own heritage’s shame. I saw on Twitter, though, all the hubbub around McGregor’s appearance and his amplifying presence for the team, up through Brad Marchand’s stellar overtime winner and the subsequent McGregor strut in celebration. As I follow a plethora of media outlets and accounts, the hype of McGregor was all over my social media. I did not see anything regarding his felonious acts five days prior. Instead, I only saw Boston and other sports media outlets hyping up “The Notorious” McGregor, citing the legend, his captivating presence, and legacy, and how exciting it is for that enigma to now be associated with the Boston Bruins, a team beloved in a city with a large Irish population for the boxing its players do whilst skating on ice. Only the next day, Sunday, hours after his appearance in the Boston parade, did I find out through my own research (to be particular, a Google search) that the Irishman was arrested earlier in the week. After seeing all the positive hoopla around him, I was amazed that this was true; it was not mentioned in any coverage I saw. Of course, his arrest is a public relations nightmare and a monstrous can of worms. Of course, no one wants to unleash that; the man is one of the most well-known athletes in the world, as well as one of the most successful, and is an enormous cult of personality (for better or for worse). For media covering the Bruins, it is best to just report on his relationship with the team that night, maybe cover his appearance in the city’s parade the following afternoon, and then move on. But that is still unacceptable. As a league and as a field of sport in general, a key conversation—particularly in the last few years—has been cutting ties with those who have run-ins with the law, especially around violent arrests. McGregor has a history of multiple accounts of violent incidents resulting in the harm of others. If McGregor were a North American player in any of the four major sports, any organization would have (ideally) cut ties with him after probably his first violent act that got him arrested. Some teams cut ties due to drug arrests; violence means something much bigger, and much worse. While that is certainly a rallying point for those who enjoy the Bruins and hockey, a violent sport, it takes the promotion of violence to a new and, honestly, negative level. Promoting Conor McGregor as a legend through the lens and association of the Boston Bruins promotes the violence he commits outside of the ring—especially the violent felonies and pending investigation that followed him to Boston by way of Florida. That is not something that the Bruins organization of the city of Boston should want in the slightest. Sports and sports coverage is not just reporting on box scores; you shouldn’t just ignore what might be damaging for the night’s festivities. I will speak plainly: As a fellow sportswriter, it is disappointing that no one else has pointed this out.